Have you ever munched on popcorns while watching a movie? Surely, you have! I mean, who hasn’t eaten popcorn in a movie theatre, right? Now, besides being tasty and an unsubstitutable better half of a movie, did you know about the several health benefits of corn? Well, eating corn is considered to be very healthy. Granted, the popcorns in multiplexes sometimes contain unhealthy fats and spices, but if you purchase low-sodium zero trans-fat popcorn from a store then it will definitely be a healthy snack for you. Corn has high nutritional contents including fiber, protein, antioxidants and phytochemicals. It contains phytochemicals that fight against a number of chronic illnesses including cancer. Organic non-GMO corn is rich in fiber; one large corn cob contains about 4 grams of fiber. Nevertheless, the same cannot be said about GMO corns. They are genetically grown in soils lacking the necessary nutrients and the chemicals might prove to be unfruitful. Here’s the list of health benefits of eating corn, especially the organic, non GMO variety of corn. Corn is among the super healthy and nutritious food options we have today. It contains antioxidants which may protect our body from critical heart disease and cancer. It also contains phytochemicals which are considered to be great for healthy vision. But then, you gotta eat it right and avoid adding plenty of butter and spices when cooking or eating corns to get the maximum health benefits of corn. 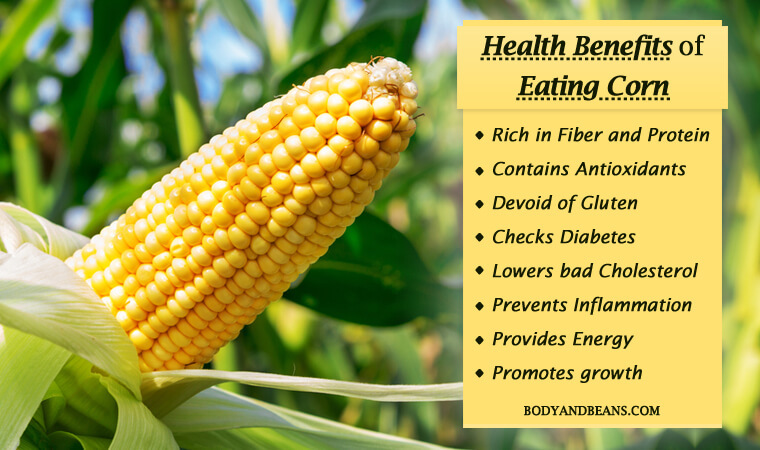 Listed below are the most prominent health benefits of corn, followed by a few quick and simple recipes which can be cooked using corn. A cup of corn kernels contains about 18% of the daily-recommended fiber intake. This property of corn makes it useful in preventing digestion problems like constipation and hemorrhoids. More specifically the insoluble fiber in corns makes it useful in this case. The insoluble fiber in corns is metabolized and converted into short-chain fatty acids that support the growth of “good bacteria” in our gut. This high fiber domesticated grass is helpful to eliminate the waste and toxins from our body and might be useful, to prevent colon cancer. The different varieties of phytonutrient blends gives corn its various colors. The carotene anti-oxidants found in corns are beneficial to stimulate our immune system and defend us against oxidative stress. Although some antioxidants lose their value due to heat, the antioxidants in corn retain a high percentage of their nutritional value when slow heated at low temperatures and that’s another advantage it has. The yellow corn, which is the most popular one, is a good source of carotene anti-oxidants, chiefly zeaxanthin and lutein. Other variations of corn supply with anti-oxidants such as anthocyanins, protocatechuic acid and hydroxybenzoic acid, beta-carotene, caffeic acid, and ferulic acid. Despite being a grain, corn is actually gluten-free. Consuming gluten not only causes digestive problems, but also is responsible for rapid weight gain. It is problematic, even if you do not suffer from Celiac disease. Celiac disease is an autoimmune disorder that causes an immune reaction on consuming gluten. So, corn flour can be used instead of wheat flour to avoid gluten. Corn contains Thiamin or Vitamin B1 that is essential for the enzyme reaction pyruvate dehydrogenase, which oxidizes the sugar we consume. Without this oxidation, the nerves will not receive the necessary energy required to function properly. This may lead to nerve damage and us having problems in moving or retaining information. According to this study, thiamine maintains proper ventricular functions and keeps heart diseases at bay. Corn also contains niacin, the deficiency of which has been linked to pellagra, a disease characterized by diarrhea, dermatitis and dementia. It also contains pantothenic acid, which aids in lipid, carbohydrate and protein metabolism. Corn also provides a large dose of our daily folate requirement. Folate deficiency in expecting mothers can lead to neural tube defects in their babies. Corns contain starch, which is a source of complex carbohydrates that helps the body maintain steady levels of energy. Foods containing high concentrations of fiber and carbohydrate, like corn, are favorable for keeping our blood-sugar level in check because the fiber slows down the rate at which glucose is being released into our blood. Corn contains much less calories than most other foods. It has approximately 125 calories, which makes it a healthy addition to our daily diet. It is actually equivalent to eating a banana, except banana has less protein and fiber than an ear of corn. Protein and fiber together controls our craving for food and stimulates proper digestion and passage of food through our digestive tract. According to this study, corn is rich in iron that is a key mineral in formation of red blood cells. Deficiency of iron is one of the chief reasons of anemia and corn can be trusted to avert anemia and symptoms of anemia, successfully. Symptoms of anemia include shortness of breath, dizziness, headache, coldness in your hands and feet, pale skin, chest pain, and weakness. Iron in our red blood cells; help carry oxygen from the lungs to the tissues. According to this study, without oxygen the primary muscle cells cannot retain oxygen. Without oxygen, these muscles will not be working at optimum level, which will lead to muscle fatigue. According to several researches, corns aids in the management of non-insulin dependent diabetes mellitus (NIDDM) or type-II diabetes. It is also fruitful to ward off hypertension due to the presence of phenolic phytochemicals present in them. This study says, phytochemicals are capable of regulating the absorption and release of insulin in the bloodstream, which prevents sudden increase or decrease of insulin level in the body and help the diabetic patients maintain a healthy lifestyle. According to Science direct, consuming oil of corn husk lowers cholesterol absorption in the body. This leads to reduce chances of cardiac arrests and strokes, especially atherosclerosis. Reducing LDL cholesterols also mean reducing the harmful free radicals in the body, generally produced by pollution or UV rays. Eating foods rich in protein, like corn, keep us filled for a longer extent of time, unlike carbohydrates and fats, which keeps our hunger in check. By eating just 100 grams of good quality corn, you get about 9g of protein, which is about 18% of the daily required quantity. 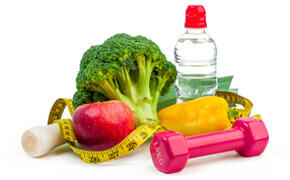 Consuming more protein stimulates thermogenesis, a process in the body involving spending more energy to digest food. Eating corn can uplift our mood. The protein in corn helps the neurotransmitter to function at optimum level and secrete hormones such as dopamine and serotonin, that helps fight anxiety and calm us down. If you are feeling low for some reason, maybe, you should eat some corn for it can quickly uplift your mood. Corn contains high concentrations of Vitamin A, which is an essential component of the rhodopsin pigment found in the retina. Rhodopsin sends a signal to the brain that allows vision, once it meets light. Vitamin A improves eye health and prevents macular degeneration. Corn contains the trace element Manganese that stimulates the enzyme superoxide dismutase. This enzyme is often termed as primary or master antioxidant as it is a powerful anti-inflammatory agent. Not only that, but also this enzyme has been known to reduce any pain or stress, which could possibly lead to chronic disorders. This is the only enzyme that can consume radicals of superoxide and hence, they are excellent anti-ageing factors. Cornstarch is used commonly to treat rashes and skin irritation. Cosmetic products, like petroleum jelly, are often carcinogenic because of their petroleum base. Cornstarch can be used instead to petroleum in the cosmetic industry. Corn is a dynamic food which can be used in multiple ways. There are a number of recipes and preparation using corns. You can have it raw, use boiled corns to make refreshing chaat or salad. You can even fry the baby corn and make a crispy munch or cook a whole lot of recipes using corn. Let’s take a look at some of the healthiest recipes of corn. Toss all the ingredients in the pan and serve the chaat while it is hot. Boil the corncob and remove the kernel. Keep about 2 spoonfuls of corn aside and blend the rest with water to make a smooth paste. Heat oil in a pan and sauté some spring onions. Add chopped celery and sauté for a moment. Then add the corn paste and keep stirring. Add milk and water and bring the soup to boil, while stirring. Add salt, pepper and the remaining corn kernels and simmer for about 4 minutes. Add corn flour to thicken the soup. Pair the soup with some toasted bread and enjoy. Mix 3 tablespoon mayonnaise with 2 chopped anchovies, 1 grated garlic clove, 2 teaspoons of mustard and freshly squeezed lemon juice. Brush grilled corn ears with this. Lastly, sprinkle with Parmesan cheese and panko breadcrumbs. Toss 2 cups cooked corn kernels with 1 pint of halved cherry tomatoes, 2 diced cucumbers, the juice of 2 limes, 1/4 cup of chopped cilantro or coriander, 2 spoonfuls of olive oil, 1 chopped seeded jalapeno, and salt to taste. The salad is, now, ready to eat. Corn is a magical food which is highly beneficial and can be consumed in various ways. The best quality corn is available during mid-summer. Refrigerate corn as soon as possible as there is a noticeable decline in the sweetness of corn, if kept outside for too long. Major health benefits of corn includes being high in fiber, promoting growth, being anti-oxidant, maintaining eye health, reducing anemia, bad cholesterol and diabetes, uplifting mood and so on. However beneficial, avoid high fructose corn syrup or foods containing high fructose corn syrup as they contain triglycerides that may harm the body. You can boil, grill or microwave corn to prepare varieties of tasty and healthy dishes. Just do not add salt in the boiling water, as salt tends to harden the kernels. Corn allergies are very rare but they do exist. Symptoms may include hives, skin rashes, runny nose, headache, nausea etc. on consuming corn or corn-containing products. Do you eat corn? If not, you may like to try some today and enjoy the various health benefits along with its yummy taste! It was really nice how you said that eating popcorn was actually beneficial to the health, especially the eyes because corn was rich in vitamin A, which was important for the rhodopsin pigment in the retina. I knew I was right when I suggested including popcorn as a snack for my sister’s birthday party. She has a very sensitive vision after all, so I at least want to include a food in the party that will actually help her eye health. Thanks for sharing. Now I have a solid argument.